The QUESTion Class is a semester-long course that fits into students’ schedules as an elective or advisory class. It is structured through facilitated discussions, co-creative exercises, student-led presentations and writing assignments. It encourages trust and openness, and generates a deep sense of interconnectedness and collaboration among peers. The QUESTion Class is facilitated through a full curriculum of 80+ lesson plans and supporting materials. It can be delivered as a daily class for the entire semester; or as a class that meets once, twice, or three times per week for the semester or academic year. A key component of the QUESTion Class are the Student Ambassadors who help co-facilitate it. In the second semester and onward at each school, students who have taken the class are encouraged to become co-facilitators for their younger peers via our Ambassador Program. Student Ambassadors work side-by-side with teachers to guide classroom discussions, ignite curiosity among students, and act as a leader in the class. The QUESTion Class is divided into five core units that support students to explore big life questions through different themes, topics and perspectives. 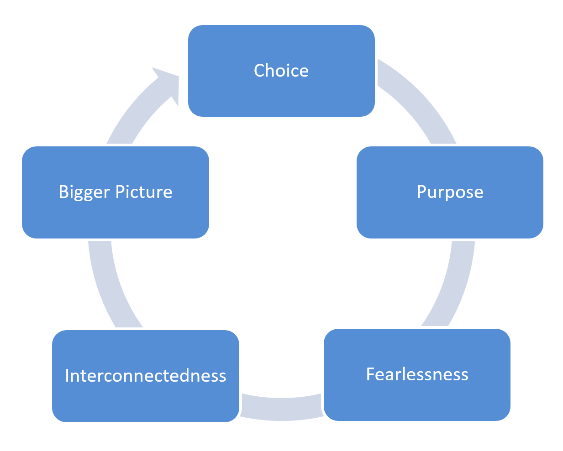 These units are: Choice, Purpose, Fearlessness, Interconnectedness and The Bigger Picture. Each unit includes over a dozen lesson plans with structured activities and class discussions. These units are the five “pillars” of the QUESTion Project; they are broad subject areas in which many subtopics and important aspects of life can be explored. Over the course of two years, several focus groups of high school and university students helped us identify the core themes and questions we address in the QUESTion Class curriculum. These five pillars provide a concrete structure for young people to explore the things that matter most. In the process, they bring out the depth of who they are and gain confidence in their own center. We create room for them to explore the empowering nature of choice, the intangible sense of purpose that can give that choice meaning and direction, and the fearlessness that is needed to stay true to oneself. We do this in a peer-to-peer context where young people can learn from each other and see their autonomy and individuality in the context of an interconnected whole. Our curriculum presents tools that help students step outside of their immediate circumstances and see their lives within a bigger picture. The 4 introductory sessions open up the space for students to experience the ongoing, creative process of discovering who they are and who they can be. They discover that by immersing themselves in life’s big questions, they can develop the capacity to shape their future and positively contribute to the world. Students write “Letters to the Self” to lay out their expectations and goals for the class – and fill in Self-Evaluation Matrixes (SAMs) to begin charting their growth in key areas of the 5 pillars and a 6th metric, Self-Knowledge. These charts are filled in again during the 4 Conclusion Sessions at the end of the course in order to provide a comprehensive analysis of students’ growth and impact of the class. By thinking more deeply about the nature of choice, students develop an appreciation for the potential inherent in their capacity to choose. Many can feel overwhelmed by the choices they have and the responsibility to define their own lives. Exploring choice in their own experience opens a sense of possibilities, and gives them the confidence to deal with the challenges that confront them. Students reflect on their sense of purpose in life. By exploring the different ways purpose can authentically take shape in one’s life they develop confidence in their own capacity to make life choices that are informed by what they find inspiring and purposeful. Students are also challenged to think about how they can connect what inspires them to what contributes to society. When students have an opportunity to speak openly about fear with peers, they discover that fear is not as unique an experience as they had thought. As they examine their fears in the context of what they find inspiring and purposeful, they gain confidence in thinking for themselves about life and develop the capacity to act in accordance to their deepest convictions. 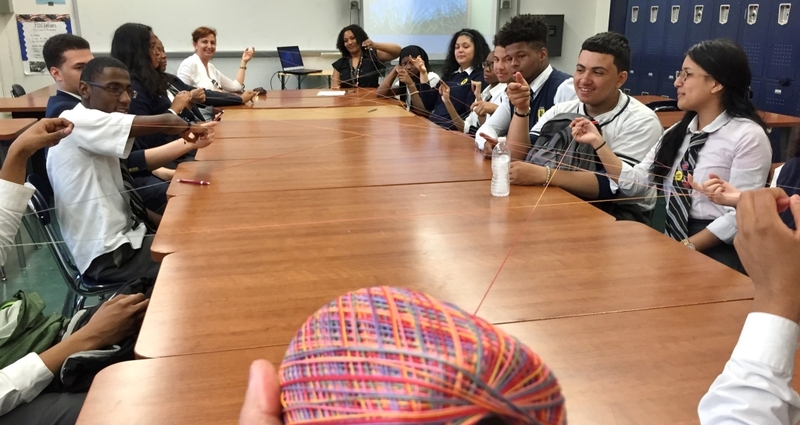 An authentic exploration of interconnectedness allows students to see through fixed ideas and barriers – in order to develop deeper empathy, compassion and care for others and the common good. By exploring how we are simultaneously autonomous individuals as well as part of a larger whole, students develop an understanding and deeper appreciation for different perspectives. They are able to put their personal biases aside to work together for a greater purpose. Students develop the ability to see their lives, the future and the challenges we face from a bigger picture. They become aware of the bigger context they are part of and realize the significance of their lives in a larger framework. They learn to expand their perspective beyond their immediate circumstances and bring more complex and creative thinking to their roles as world citizens. Students reflect on their shared journey into questions of meaning and purpose. They discuss insights they have gained from each other, as well as changes they have seen within themselves and their classmates over the course of The QUESTion Class. They complete the Self-Evaluation Matrixes (SAMs) they filled in at the beginning of the Course in order to chart their personal growth in the 5 pillar areas and a 6th metric, self-knowledge. Each of the five core units includes facilitated lessons to bring out the big ideas behind each pillar, inspire students to think critically and widen their perspectives about the particular subjects being addressed. 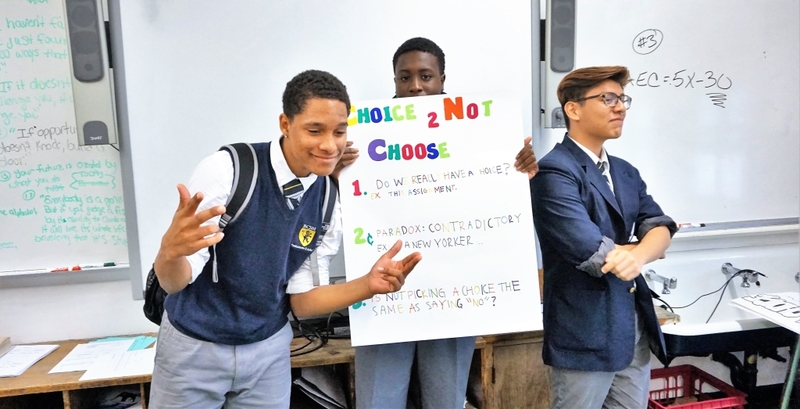 Following these facilitated lessons, students actively engage in peer-to-peer learning by preparing and sharing their own student presentations in teams of three or four. Lastly, each unit includes a writing assignment on the core areas presented. 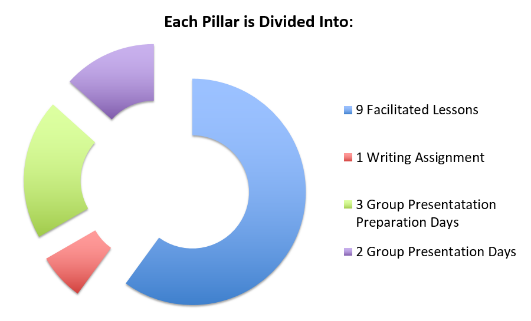 To begin each pillar, teachers facilitate lessons to expand students’ thinking and explore different areas of the unit theme. These lessons include a variety of exercises, independent notebook assignments, group work, debates, videos and class discussions. Students divide into groups of 3-4 to prepare presentations using their knowledge of the topics we explored and discussed as a class. They add new angles and expound on their experience to produce their own video presentations, PowerPoint slides, skits, poetry, and even short “talks” in the format of TEDx presentations. Through these presentations, teachers are able to assess how well students can authentically express their understanding in relationship to the content area covered. As both a test of their knowledge and a self-reflection exercise, students complete one in-class writing assignment per unit (for a total of 5 assignments throughout the semester). These assignments include three big questions for written response.